Do you have old tree stumps blocking areas of your garden or backyard? Tree stumps can pose a safety risk to those around you and, if not removed effectively, can leave an unsightly mess on your property. At All Trees Perth, we offer a comprehensive range of tree care solutions including affordable and efficient tree stump removal and grinding to homes and businesses across Perth, Western Australia. Stump grinding is the process of removing a tree stump, which may still be buried deep in the ground even after a tree has been cut down. It requires the use of complex machinery to grind down the stump below ground level. This grinding ensures the tree’s inability to regrow and eradicate its visibility and allows the area to be used for other purposes. Tree stump removal in Perth is a necessity and should not be ignored as many Australian trees can grow extremely wide in diameter. WHY IS TREE & STUMP REMOVAL IMPORTANT? Stump grinding is an essential part of tree removal. After a tree has been cut down, the stump which is rooted deep in the ground must also be removed. If the stump is left to rot in the ground it can become unsafe, resulting in numerous problems including termites and pests as well as becoming a trip hazard. Tree and stump removal is an essential process, necessary for preventing unwanted trees from growing back and for freeing up the area for future plants. We have the most narrow access stump grinding machine available, to ensure access through backyards and into those hard to reach places. This means we're equipped to handle any tree stump removal and grinding jobs in Perth, no matter their size or location. With its articulated movement and 750mm wide body, it can go almost anywhere on your property, allowing us to complete stump grinding for both large and small tree stumps. 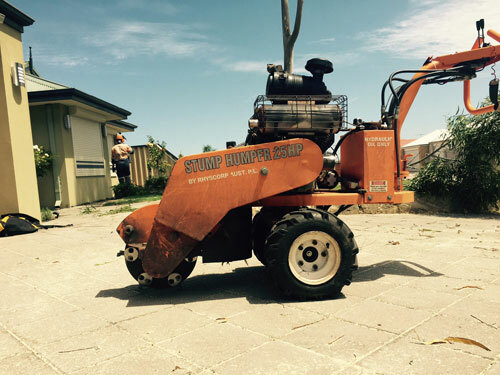 You can always rely on All Trees Perth for your stump grinding jobs - we're happy to help! WHY USE PROFESSIONALS FOR STUMP GRINDING IN PERTH? Not only does stump grinding and removal require a specific set of power tools and equipment, but this process is not simple and for your safety, we highly recommend seeking help from a trained professional. At All Trees Perth, we have over a decade of experience working with stump removal in Perth and during this time have acquired the best equipment, personnel and expertise. Don’t take on the risk of a DIY job. Call us today for easy and affordable tree stump removal and grinding for your local suburb. Our expert team are fully trained to safely undertake tree and stump removal in Perth and surrounding metropolitan areas. If you or your business are in need of stump removal in Perth, contact our team today! Highly professional, friendly, efficient, affordable and tidy! I recommend All Trees Perth to everyone, they did such a great job. Donny is highly professional, motivated, friendly and made the impossible task a breeze! Thanks Donny for the outstanding job! Would highly recommend to others! Donny & his team were amazing. Competitive quote and a highly efficient service. Job was done swiftly & professionally! Would recommend to friends and family! Happy to support a WA family run business! Donny was on time, very professional, tidy and did a great job. I would have no issues recommending him to friends and family. All Trees Perth removed a banksia for me, they were outstanding... they arrived on time, extremely efficient and friendly and removed the tree with the minimum of fuss. They were very safety conscious and had great equipment. They had a mulcher which recycled the whole tree. I would recommend their service to anyone. Donny from All trees did an unreal job, it was clean and tidy and he did two days of solid job and cleared 1/4 acres of trees. He's also affordable in providing building supplies. All Trees Perth did an excellent work for the tree pruning job and they cleaned up thoroughly. Donny and his coworkers were very professional. I will definitely use them again and I would recommend them to anybody. I have very positive experience with All trees Perth. They were very professional and was also efficient with the tree lopping that they did for us. I am happy with their services. Clean, efficient work; friendly service and competitive quote. Highly recommended.